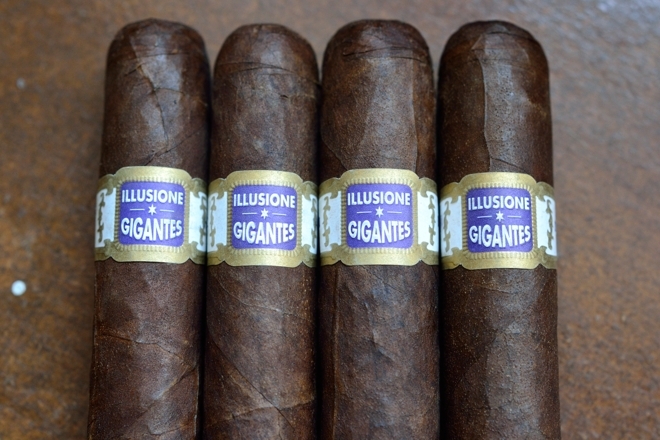 Ever since Illusione announced the release of his newest cigar, The Gigantes, I have been on the edge of my seat, drying to try them. Last year I rated his Rothchildes as my #1 cigar of the year and to this day smoke it on the regular. I have to hand it to Dion, one week after announcing the blend the Gigantes were already hitting store shelves and luckily I was able to get my hands on a few. 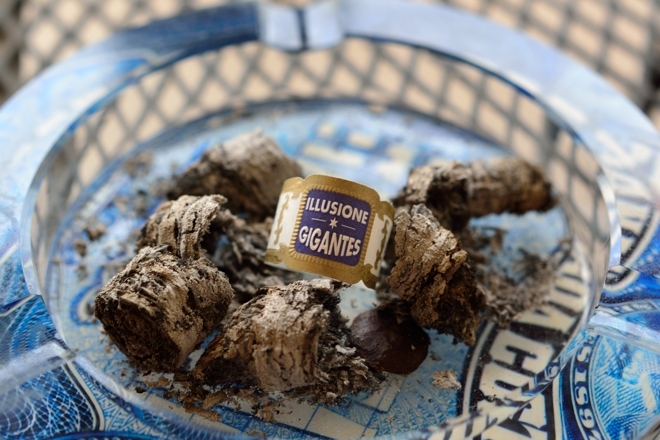 Prelight: Much like the Rothchildes, Illusione’s Gigantes carries a very deep, dark brown wrapper with bits of medium brown and spots of a darker brown around the veins and webbing in the tobacco leaf. The wrapper is incredibly tooth and feels almost like sandpaper with a good amount of oils. The wrapper is solid, thick, and very hard. It feel like I could probably sound down my next woodworking project with this cigar. The wrapper actually has a very rustic, crude look to it as it showcases the natural characteristics of the tobacco leaf. Considering how much Illusione I smoke, holding one with a ring gauge as large as this is a bit of a departure from what I am used to. 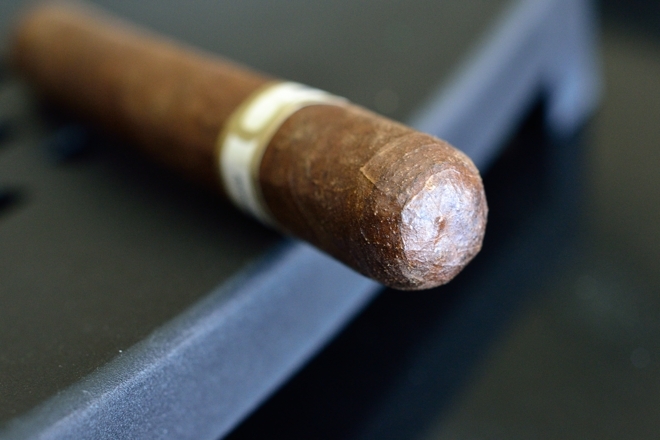 The cigar is heavy and dense as the body leads up to a perfectly round triple cap. The Gigantes is polished off with a band identical to what we found on the Rothchildes. The only differences being the word “Gigantes” and of course the purple color instead of the red. I absolutely love these bands. The remind me of an older era. Think Henry Clay. 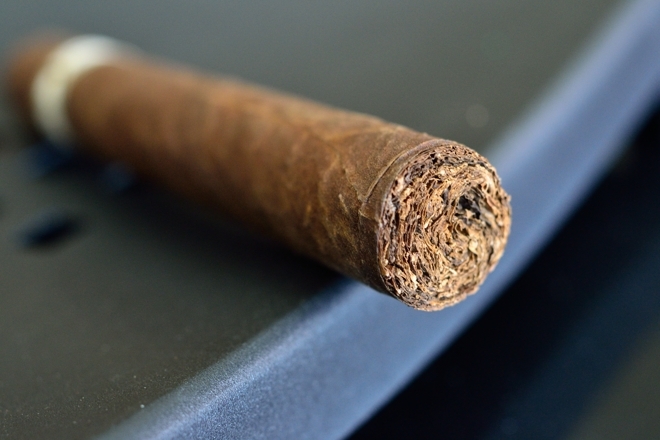 The wrapper on the cigar gives off a sweet aroma of chocolate and tobacco while the foot of the cigar is much more natural leading with lots of earthiness, and spice over natural tobacco aromas. The cap cut clean, but took a bit of extra pressure from my double bladed Palio cutter. The cold draw produces are really nice spice over some pepper, espresso, and natural tobacco. 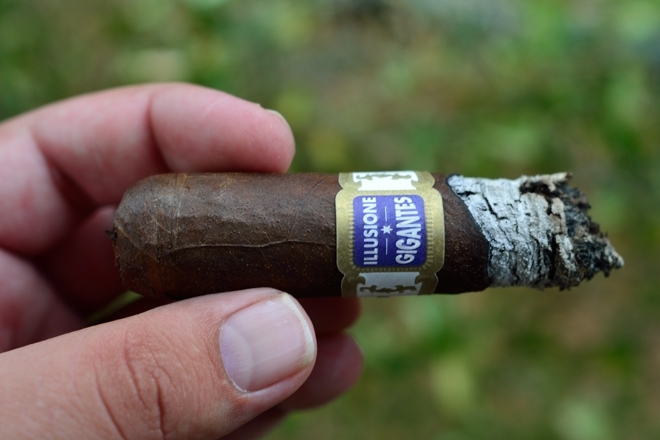 First Smoke: Illusione’s Gigantes starts out really bold with some strong cashew and raisin over some spice, natural tobacco, and cocoa with a nice tart twang on the aftertaste. I was expecting much more pepper but was pleasantly surprised with the sheer amount of flavor the Gigantes kicked out right off the bat. The draw is remarkable as it takes almost no effort to get a mouthful of very thick, white smoke. The burnline is a bit wavy, but razor sharp leaving behind a trail of very compacted white ash which held on for an inch and a half before giving way. 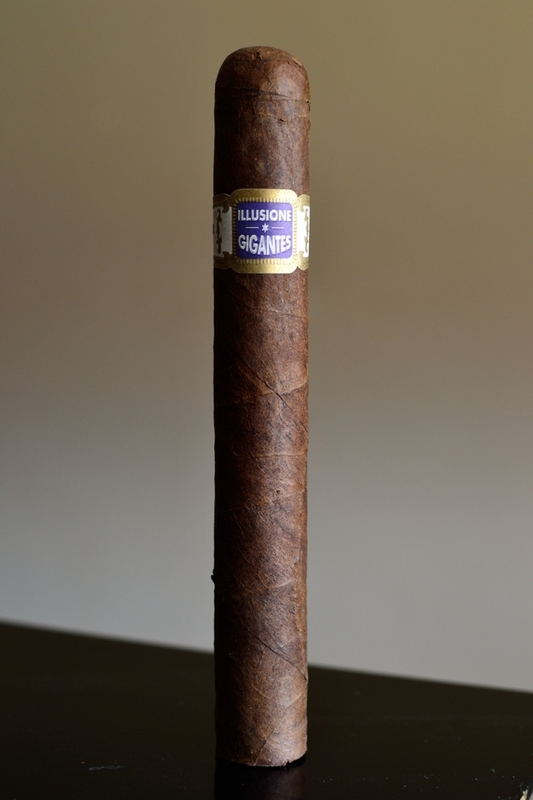 Halfway There: One of the more interesting characteristics of the Illusione Gigantes is the aftertaste. There is a very bold woodsy, cedary, fruit, tart flavor that’s left behind for minutes after each puff. It’s incredibly enjoyable and only enhances the already potent flavor profile which is now running with tons of cocoa and spice over fruit and cedar with hints of espresso. The burnline is still a bit wavy but I have yet to have to reach for my lighter so no complaining there. The retrohale is ridiculous coating my nasal passage with so much cedar and spice. While the body of the cigar is just piling up, the strength of the cigar is remaining rather tame as I close out the second third with no nicotine kick at all. Gotta love when cigars do this. Finish: The final third of this Illusione Gigantes is where the deeper, richer experience really comes into play. That crazy aftertaste I spoke off is now dominating the smoke leading off with really heavy smoked woodsy flavors with strong spice backing it along with some great fruit, cocoa, and tobacco. This is where the cigar really separates itself from the Rothchildes. Along with the ramp up in flavor the strength has began to ramp up as well. It’s not too strong, but I definitely feel the difference. Over the course of the 2 hours it took to take the Gigantes down I never once had to touch up or relight the beast, I experience absolutely no harshness, and only a small about of extended heat into the final inch or so. Overview: Dion does it again. I can’t say much more about the Gigantes other than how much I thoroughly enjoyed it. 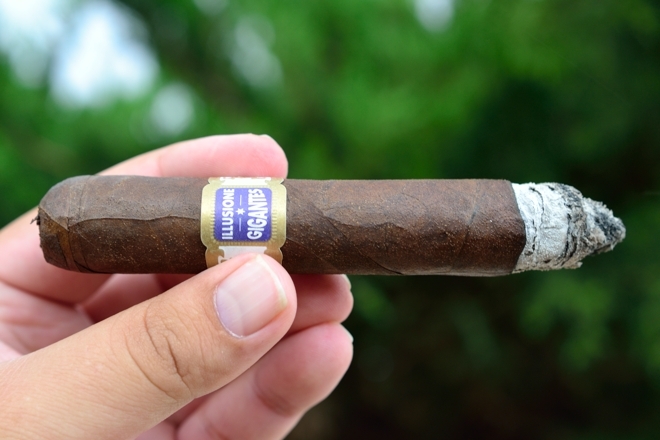 The bold and complex flavors are right up my alley and I love that he produced them without having to create a cigar that was all about the strength. I think that far too often cigar manufactures think that you can’t have a bold cigar without having all the strength, and Illusione proves that to be wrong with almost every blend they create. 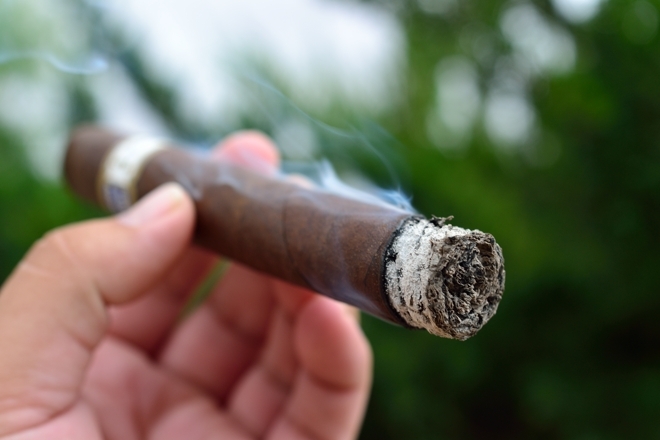 Although the cigar has a rustic look, the burn performance was close to flawless. The price point is absolutely spot on, and actually probably a lot lower than I’d be willing to pay for the Gigantes. I am so glad that I opted to purchase half a cabinet of these and even then I worry that might not be enough. For the price, this is a cabinet purchase for sure and I fear that I may even want to have more than that on hand is this cigar is incredible and is going to make for another strong contender in our top 10 cigars of the year. And to think, we are only half way through. 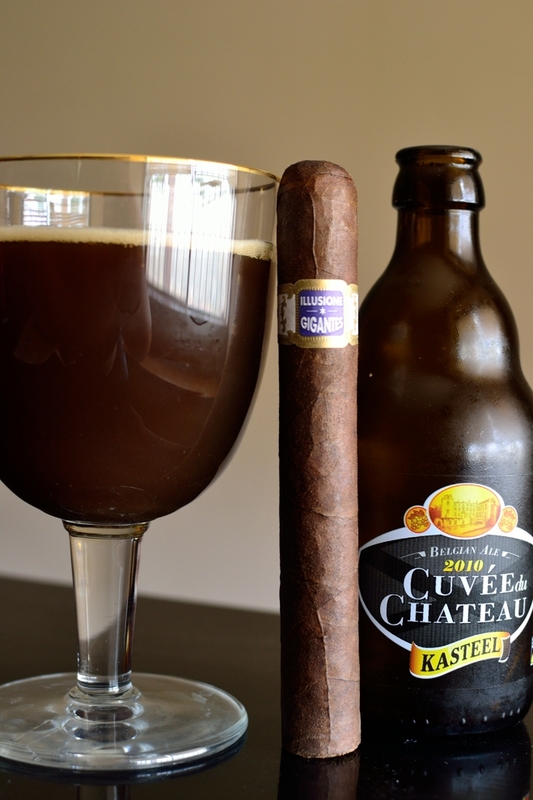 Pairing: Kasteel’s Cuvee du Chateau is an 11% Belgian Quad brewed at the Brouwerij Van Honsebrouck N.V. in Belgium. This is one of my go to Belgians as it fits all the main categories I look for in a good beer, at a reasonable cost. Cuvee du Chateau runs about $5 a bottle and carries a big, boozy body loaded with strong fruits (fig, apple, pear) flavors over some sweetness and spice finishing with a bit of malt and cinnamon. The fruit and spice is what had drawn me to pair this bad boy with the Gigantes as they married up perfectly. The woodsy flavors form the Gigantes actually added a bit of a smoke profile to the beer resulting is one badass pairing. Man, you ain’t kidding! I’m finally smoking the one you sent me, and it’s a flavor bomb right off the bat, with damned near perfect construction and burn. I definitely need to get more of these, and although I don’t have a Belgian brew to go with it, this Franziskaner Hefe-Weissbier Dunkel is a pretty nice accompaniment.